The public cloud was built, first and foremost, to enable companies to deliver web applications at scale. Fast forward a decade and today the cloud is used for much more than that. One of the most exciting use-cases that has emerged is leveraging the vast computational power of the cloud to run high-end workloads, such as conducting scientific experiments or training deep neural networks. These applications have a much different usage pattern than traditional web services: They are short-lived and tend to run in batches. To respond to this new behavior, the concept of low-priority instances (commonly referred to as "spot instances") was created. Low-priority instances are essentially spare capacity in the cloud that is offered at significant discount (compared to the regular on-demand price) but with the caveat that if the capacity is needed for other tasks, they may be interrupted. We are happy to announce that Gradient° now supports this class of instance type which we are calling "Low-Cost" instances. 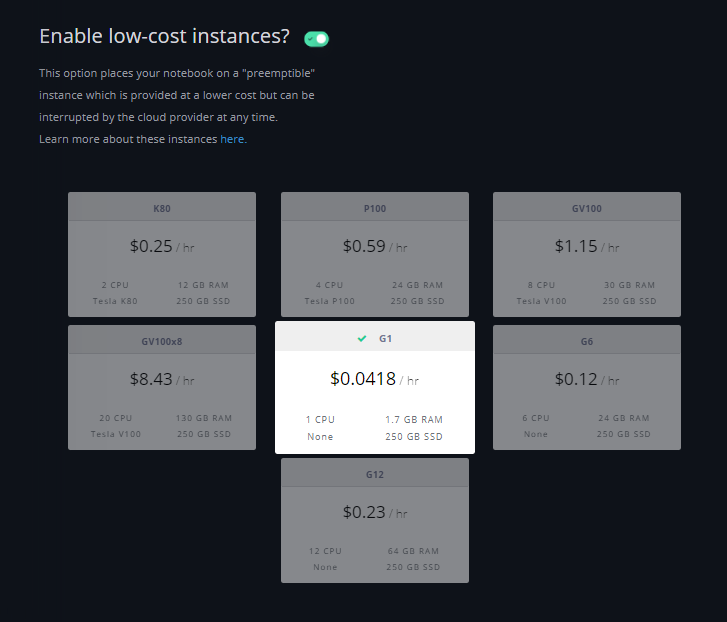 Low-cost instances are discounted by as much as 65%, depending on the instance type. They can interrupted at any time, even within the first few minutes. They are always shut down after 24 hours so they are not suitable for long-running jobs. They cannot be migrated to a regular VM instance. If your workloads are fault-tolerant and can withstand possible interruptions, then Gradient Low-Cost instances are a great fit and can significantly reduce compute costs. For example, using checkpoints with TensorFlow and PyTorch will enable you to train deep learning models on Gradient Low-Cost instances without the risk of losing progress made before the instance was interrupted. For more details on Gradient Low-Cost instances, please check out the Help Center. For more pricing information, take a look at our Gradient pricing page. This post will give you a detailed roadmap to learn Deep Learning and will help you get Deep Learning internships and full-time jobs within 6 months.